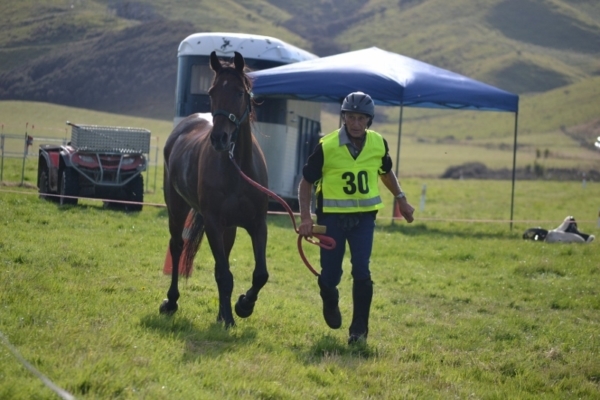 The weather played ball turning on two fine sunny days for the Ruahine Endurance Cub’s two day event at the popular Waiouru venue. Recent changes to the national endurance rules have seen the re-introduction of classes held over two days and six combinations lined up to tackle the 120km, with 60km on Saturday and the remaining 60km on Sunday. Other two day classes held were over 100km and 60km. Don Sagar once more proved that age is no barrier to success winning the senior 120km on Wai Totara Moon Start. Jayden Loveridge took out the JY 120km on Makahiwi Phoenix. In the 100km Pippa Roberts riding Wai Totara Rameriz (owned by Don Sagar) took the honours from Deirdre Bartlett riding Craig Royston Xmas Star.